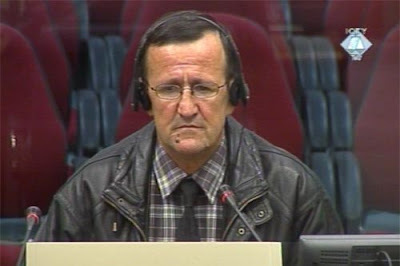 Mustafa Sacirovic, private investigator in charge of Srebrenica. The Srebrenica Genocide Blog would like to honor Mustafa Sacirovic as a hero. He is the second person - only after Jean-René Ruez - to be honored by our blog for his contribution to the truth about the Srebrenica. Both Sacirovic and Ruez worked as investigators in the case of Srebrenica. Sacirovic collected and preserved a multitude of evidence relating to the Bosnian Serb war crimes in and around Srebrenica from early months of the Bosnian war and leading to the July 1995 genocide. He handed his evidence to the prosecutors of the International Criminal Tribunal for the Former Yugoslavia and testified about the ghastly crimes that Serbs around Srebrenica perpetated against Bosniak civilians in early months of war. Mustafa Sacirovic's investigation centre "The Union of Victims of Genocide of Bosnia-Herzegovina, Enclave of Srebrenica, Centre of Investigation" is based in Portland, Oregon. The centre has collected a large archive of tapes, testimonies, and exhibits relating to war crimes in and around Srebrenica from early 1992-1995. The archives include records of all major massacres perpetrated against the Bosniak civilians - women, children and the elderly - around Srebrenica in the first months of war, like massacres in Hranca, Glogova, Bljeceva, Suha, Mihajlovici, Krasan Polje, Podcaus, Boljevici, Zaluzje, Abdulici, Bjelovac, Zapolje, Tegari, Jagodnja and Jagoseva - including the crimes in Vuk Karadzic school in the neighboring Bratunac. Mustafa Sacirovic, we thank you for your hard work and contribution in preserving the truth. We're proud of you.